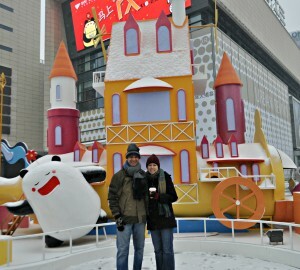 Day 254 in Beijing: Happy Valentine’s Day! This is the first Valentine’s Day with my darling, Jill. We will be spending it, somewhere, in Beijing. It will a Friday night here, and a day before you experience it, so we will probably go out to dinner, hang out with some friends, and just see what the day brings us. I work on Sundays, Mondays and Tuesdays so we will have the whole day to relax, lounge around, and just kick back. I used to be a pretty reactive and emotional guy. I dealt with my own depression and anxiety for many years. I then learned about Cognitive Behavioral Therapy and found that both depression and anxiety are primarily lies that I’m telling myself about me. They are either cognitive distortions or just flat out mistaken beliefs that perpetuate the problems that I’m causing. It really did come down to the fact that I’m making my own problems and causing them to occur each and every time I had a thought, had a feeling, or did an action. The joy of this realization is that it also gives me the ability to change all of the beliefs, emotions and actions that I take and become a truly happy and content person. I think back to the years of pain and anguish I felt and wonder what would have happened if I had learned about this therapy, and began practicing it with my clients, when I was 20 years old or younger. I know it doesn’t really matter because one can’t change the past and yet I think that is one of the reasons that I practice Cognitive Behavioral Therapy now: It can cure issues very quickly and is far better than any other therapy out there as shown by any evidence-based studies. Freedom to live your life is in your hands at this very moment. I did and I am glad I choose never to go back to those patterns again. My parents, my society, and my peer group no longer defines what I do. It is up to me to live the life I want and no make excuses for my thoughts, emotions or behaviors. This is where Valentine’s Day fits in. I met Jill 8 days before I left for China. We met at the San Francisco Carnaval parade. 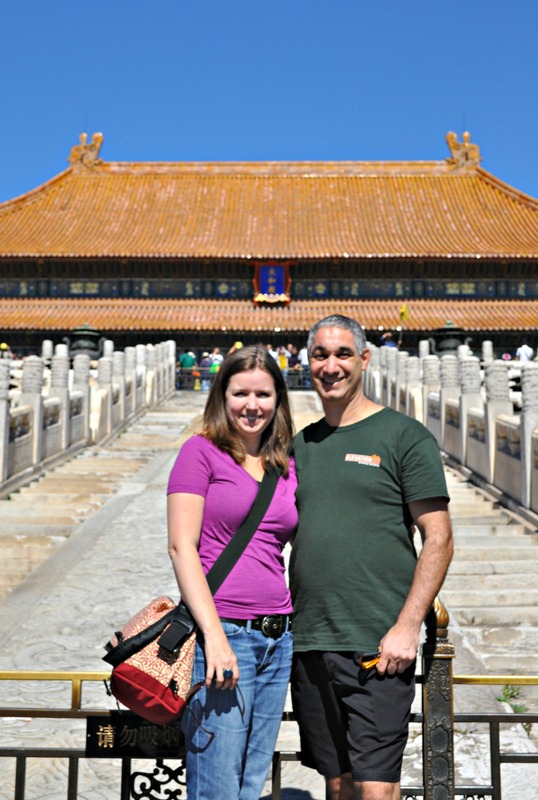 We spent the next 8 days together and I invited her to come with me to China. She had been living in Airbnb apartments for the last 2.5 years, and, when her agreement ran out, she came over. That was 6.5 months ago. We both take responsibility for our actions, thoughts and behaviors and try to treat each other as well as possible. There is almost no drama or disagreements because we are open, fair and try to anticipate what the other wants and we make sure each person has their needs met to the best of our abilities. The way I see it is if we can make it, living in Beijing, and building a brand new life here, everything else will be a breeze. Happy Valentine’s Day to my darling Jill! Day 249 in Beijing: Matching Shirts. 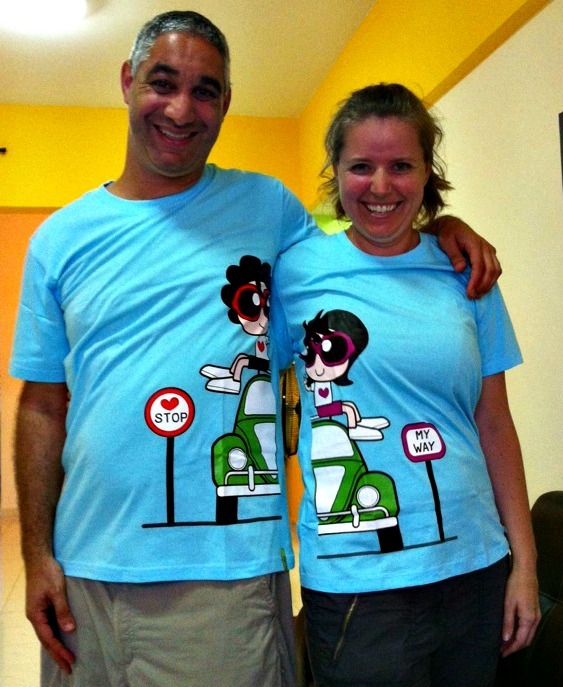 We love our little motorcycle and sidecar shirt! Jill and I went out to dinner with our friend, Brian, a few months ago. He introduced us to one of his friends, Laurie Burkitt, who writes for the Wall Street Journal. She did a piece on couples that wear the same shirt to show love and affection since there isn’t a lot of public displays between people in China. Well, Jill and I took it one step further. As we were walking around Maleka, with our friend Dipesh, we actually found shirts that are a “combined” cartoon when we wear them side-by-side. Yes, we really are that dorky. 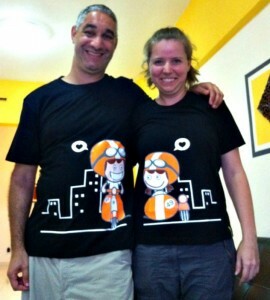 We have worn them a few times in Beijing and our friends laugh and think they are pretty cool. I’m glad we bought them so we can show affection to each other while not offending anyone. Actually we do hold hands and kiss in public. 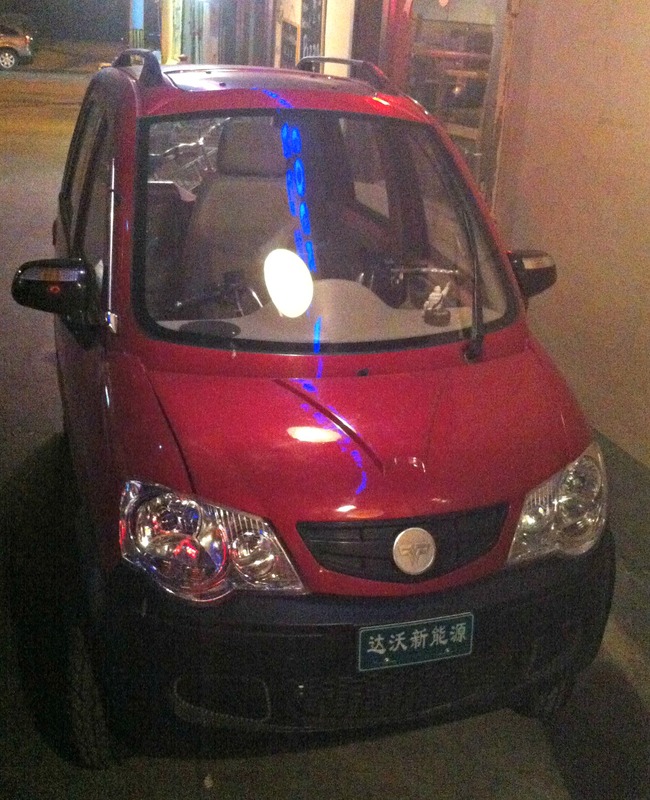 Day 246 in Beijing: Cute Car! 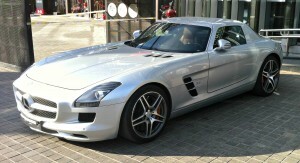 Cute car for two…or three! Jill, our roommate, Gulzar, and I were walking home a few nights ago. We happened to walk by this absurdly cute little car. I didn’t get a picture of the side, but amazingly, this is a 4 door car. The car is shorter than any other 4 door car I’ve ever seen, and is shorter than almost any other 2 door car I’ve seen also. If you notice, the front seat is just that: A single front seat that only accommodates the driver of the car. There are two back seats and they are basically like a bench seat as they are connected and if you lay one down, they both have to be laid down. The steering mechanism looked like something from a motorcycle and then adjusted for 2 wheels in the front. I’m guessing that this automobile company took the guts of a motorcycle, strengthened it, and then put a very lightweight body on the frame. This is about all Jill and I would need to be more mobile in Beijing and I’m guessing it probably costs about 1000 USD at most. Day 239 in Beijing: Pondering the Past, Present and Future. 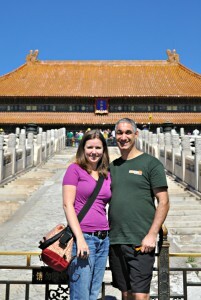 Jill and me at the Forbidden City. Chinese New Year is tonight. I sit and ponder what culture, family, and happiness is today. I look to the past and see how different we are compared to when extended families were the norm and most people lived with 3 or possibly 4 generations under the same roof. In the West, this is pretty rare but, in China, this still occurs. Then again, in China, there are kids living with their grandparents, and parents having to live hundreds, and possibly thousands, of miles away, to make ends meet. As I sit in Beijing, with Jill, and we are getting ready to go out to a hotel and watch hours of fireworks and firecrackers (Beijing’s Chinese New Year’s fireworks are the world’s largest unorganized fireworks display every year) I realize how lucky I am. In fact, at 8 am the day of Chinese New Year’s, as I’m writing this, firecrackers are already going off. This will last for 10 days straight. I has been recommended by friends that live in Beijing that we would be smart to buy earplugs so we can sleep. My life, in almost every way, is exactly the life I want to live. The only problematic issue is being apart from my family and friends back home. This becomes quite obvious when someone passes away or a wonderful occurrence happens like a wedding that I will miss because of the distance. Jill’s grandmother died this week, at the age of 97. She wasn’t able to go home because of the long flights, then long drives, and the timing of everything. So we celebrated Grandma Helen with a few of other dear friends and talked about her life. I believe that this way of of “family” that expatriates learn to accept and master if they want to stay stable and content living far from people they love. Some people don’t like being this far from their “family” and yet others love it. That is all there is, in a way, yet there is so much more. My family includes my father, Michael, my mother, Judy, my sister Stacy, and my brothers, Robert and David. If you extend it a little farther it also includes my step-father, Phillip and his son, Kody. If you then extend it farther it includes my aunts and uncles, cousins, nieces, nephews, brother in laws, sister in laws and other people that continue outward into the human race. Do I include my friends? Do I include my enemies? Do I include people I have never met? Do I include people that I will never meet? I think of the Buddhist belief that we are all tied together and there is no self in regards to caring about, and connecting with, others. Strangely enough this is often mistaken for Buddhist lore but it was stated by an MIT meteorologist named Edward Lorenz in 1906. I love how science and Buddhism are like cousins, far removed from each other, but actually closely intertwined. Most of us, at least in the Western World, think of ourselves as more individual and fairly limited to a family connection. I would suggest otherwise. I believe that we are all connected. If you trace my DNA and your DNA back to a certain point, we most likely all merge at some place. According to the story of Adam and Eve, all humanity descends from two people. Other religions have similar ideas. As we progress scientifically, I am interested to see what science finds out about our genetics and our connections to each other. As noted before, I work as a behavioral therapist. This belief is one of the reasons that behavioral therapy is so useful to my clients. I also use behavioral therapy on myself for the same reason. One of the tenets I learned from David Burns, MD, and my supervisor Brac Selph, PhD, was that I had to go through all of the interventions that I would ask my clients to go through. I would learn more empathy for them and understanding of what they are trying to achieve and how hard it is. I have done, and continue to do this, and I find more evidence, each time, for the method I use and the responses my clients get to heal themselves with an amazing amount joy. I look at my past and wonder how much easier life would be if I could just learn, adapt and discard illogical, useless and harmful information and feelings instead of holding onto them and causing damage to myself, others and the universe. I am doing that more and more each day and can quantify exactly how much better my life is now. I welcome you to do the same on this, the first day of the Chinese New Year and Year of the Horse.